Disclaimer: The following web sites are not associated with, endorsed by, or sponsored by the Gold Star Wives of America, Inc., or its Board of Directors, and has no official or unofficial affiliation with the Gold Star Wives of America, Inc., or its Board of Directors, or its membership. This web page was created as a resource for the members of Gold Star Wives of America, Inc. as well as use by the general public. Folds of Honor is a 501(c)(3) charitable organization with a mission to empower deserving military families with educational support and opportunities. FHF provides post-secondary educational scholarships to the spouses and children of service members disabled or killed as a result of their military service to our great nation. Our unique scholarships can be applied to schooling now or held by Folds of Honor on behalf of young children until needed at the time of enrollment. The Folds of Honor Foundation has teamed up with the Hartwell Foundationto help even more children of those who gave their lives defending our freedom. An initial contribution of $500,000 is now available and will provide medical care, counseling, education or anything else they may need. The Hartwell Fund is primarily for younger children. "Since 2001, Fisher House Foundation has administered the "Scholarships for Military Children," a scholarship program for the sons and daughters of service members, which in the last 10 years, has awarded $8.3 million in scholarship grants to 5,400 military children. Children of Fallen Patriots Foundation provides college scholarships and educational counseling to military children who have lost a parent in the line of duty; including casualties from combat, training, illness and suicide. We aim to bridge the gap between the VA, and other grants, and the total cost of undergraduate college education or vocational school. Fallen Patriots serves surviving children (step-, foster-, and adopted-) of fallen service members from all military branches and components. There is no age limit to enroll a child, and scholarship applications are accepted year-round. Financial help includes, but is not limited to, ACT/SAT prep and fees, college application fees, tuition, summer courses, study abroad programs, books, living expenses, computers, and student loans. For questions regarding enrollment, please email enrollments@fallenpatriots.org. The mission of this scholarship program is to help prepare military spouses for meaningful employment and to better contribute to their family’s financial security.The Joanne Holbrook Patton Military Spouse Scholarships are awarded to spouses of all Uniformed Services members. The Surviving Spouses Scholarship Program presented by BAE Systems, Inc. provides scholarships to single parents who have lost a spouse in Operation Enduring Freedom or Operation Iraq Freedom. This program will afford individuals the opportunity to attain a post-secondary education through a holistic approach. Scholarships may be used for tuition, books, utility bills, car maintenance, childcare or any other financial need that contributes to the recipient’s success in school. In addition, counselors are available to serve as coaches and assist with day-to-day issues such as financial planning and tutoring. The Buick Achievers Scholarship is open for high school seniors, high school graduates, or current postsecondary undergraduate students. The Scholarship program is proudly funded by the GM Foundation. The Scholarship Program rewards students who have succeeded both inside and outside of the classroom and who may not be able to attend college without financial assistance. It's a reward for what you've made of yourself and the difference you are making for others. The Buick Achievers Scholarship Program is awarding 50 Buick Achievers Scholarships of up to $25,000 to the winning candidates. This scholarship is for students who plan to enroll/are currently enrolled in an undergraduate program at an accredited four-year college or university in the United States or Puerto Rico. To qualify for this scholarship, applicants must plan to major in a specified course of study that focuses on engineering, technology, or design. Applicants must demonstrate an interest in pursuing a career in the automotive or related industries while using these areas of study. Applicants must be US citizens and have permanent residence in the United States. Special consideration will be given to first-generation college students, women, minorities, and military veterans or dependents of military personnel. The funds for the scholarship come from the GM Foundation, not the General Motors Company. The GM Foundation is a 501c (3) organization that is separate from GM. The Military Order of the Purple Heart Scholarship is available to the recipient of a Purple Heart; a direct descendant of a member of the Military Order of the Purple Heart or of a Veteran killed in action or who died of wounds; or a spouse or widow(er) of a recipient of the Purple Heart. The MG James Ursano Scholarship Program is a need based scholarship program established to assist children of Army Soldiers in obtaining a 4-year undergraduate degree. Applicants must reapply each year and may receive assistance for up to four academic years as long as they meet the eligibility criteriaThe Spouse Education Assistance Program (SEAP) is a need-based education program designed to provide spouses of active duty or retired Soldiers with financial assistance to pursue a 4-year college degree. Applicants must apply each year, and scholarship awards do not exceed four academic years. This grant program is competitive in its need-based selection criteria, uniquely tailored to recognize the proper weighing of family income and education cost factors. These $2,000 grants are awarded to selected sons and daughters of Active Duty, Title 10 AGR/Reserve, Title 32 AGR performing full-time active duty, retired, retired reserve and deceased Air Force members; spouses of active duty members and Title 10 AGR/Reservists; and surviving spouses of deceased personnel for their full-time undergraduate studies. The American Legion Auxiliary sponsors the Children of Warriors National Presidents' Scholarship to support the children of our warriors. These scholarships are awarded to 15 students annually who excel in academics and volunteer in their communities. 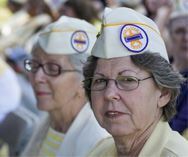 The American Legion Auxiliary's goal is to do all we can to make that happen, and that’s what the Non-Traditional Student Scholarship program is all about. These scholarships help people who are part of The American Legion Family pursue a college degree later in life or allow them to pick up where they left off when their studies were interrupted. If you’re at this place in life, this may be the right scholarship for you. AMVETS annually awards scholarships to Veterans/active military, their sons, daughters or grandchildren. A son, daughter or grandchild of a deceased Veteran is also eligible. Moaa Provides scholarships and grants for all levels of rank. The Navy League Foundation awards scholarships to high school seniors who will attend college in the fall. Navy League Foundation Scholarships are available only to children and grandchildren of former members of the Sea Services and those currently serving. Presently the Foundation has twenty five endowed scholarships. Scholarships are award for four years and provide an award of $2, 500.00 per year. AdvancedWriters - professional essay writing service If you need expert help with scholarship writing, a team of highly skilled writers from online essay service will prepare a top-quality scholarship essay for you.